You’re paying double for this. While customers never loved surge pricing—the company has begun phasing it out in favor of dynamic but “upfront” price estimates—it made sense with rides. There are lots of situations in which a bunch of people want to get a car at the same time and their alternatives are limited. Maybe it’s pouring rain and the closest public transit option is a 10-minute walk. Or a concert lets out at 2am and the system has shut down for the evening. You can imagine plenty of scenarios in which Uber charges more and, for lack of other options, a good number of people are willing to pay it. But food delivery isn’t like that. Uber argues customers will pay more for the guarantee of food delivered quickly, but that’s only true to a point. 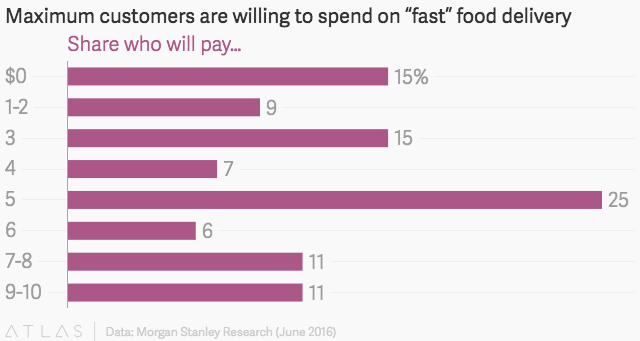 Research published over the summer by Morgan Stanley found that the majority of people will spend no more than $5 for “fast” food delivery, and that 15% won’t pay anything at all. And so if Uber charges double to deliver a burrito during the lunchtime rush, most people will probably start looking for other options. Certainly in the six cities where Uber is testing surge pricing for Eats—Atlanta, DC, Dallas, Houston, Miami, and Phoenix—there are plenty of them. Customers looking to avoid the surge could just as soon get it from another startup like DoorDash (which doesn’t surge its delivery prices) or an online ordering service like Grubhub/Seamless (which charges delivery fees only if the restaurant chooses to have one). Perhaps even Amazon, which is building out food delivery, has launched there and ordering comes free with Prime. Uber’s argument that the economics of food delivery and ride-hailing are analogous falls short in another crucial way. With a ride, Uber’s sole concern is how quickly it can get a driver to you. Charging riders higher fares—and promising drivers greater earnings—should take care of that in a rational market. But with food, getting a delivery driver is only one step in the process. If orders are piling up, higher delivery fees won’t make the restaurant prepare its food any faster. Yes, Uber says its technology and “on-the-ground operations teams” help it “work with restaurants to optimize prep times and get food as quickly and reliably from A to B.” Even so, unlike with rides, Uber isn’t always in control.